I printed a very narrowly fitting freely rotating Bowden coupling and it had such a good grip on the PTFE that I printed another with just a little more contact area. You don’t need the nut anymore for the Bowden cable! I had been looking for push to fit couplings ever since Charles Pax showed me how good they fit to 1/8" PTFE cables. Now it appears that they are definitely printable! A push-to-fit bowden cable coupling. 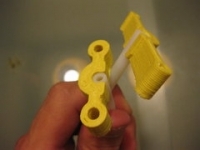 You can mount it on the the hot end of your extruder or to the drive mechanism of the extruder. 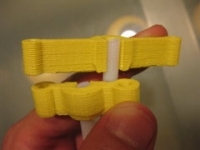 Find the part on Thingiverse here! The current push to fit coupling can be removed sideways. If you pull it sideways at the top first, you can pull it out with the plastic filament inside. It’s a huge benefit to not have to pull back the plastic first. A variant with a clip that you can pinch with your fingers would perhaps be even better, but this one is so simple and very functional and it hardly takes up any space. I also included a cable to cable coupling, you just put in two cables sideways. When done correctly, this type of friction from printed parts could be used for the extruder drive mechanism too, replacing the metal pinch-wheels that we currently use. In any case it can already withstand more than the force the force that the filament is driven with, and that’s with ultra-slippery PTFE! It would also allow us to print fasteners! Though perhaps a simple plug and a cam mechanism will better do the trick. And if you get a similar friction fit on the filament itself, you can start ysing that as structural material too (with some creep, but you could re-tension things once in a while). Before, you needed this version with a nut threaded onto the PTFE tube at each end. You can find more details on the Bowden extruder here. Search for the most recent implementations with this link. I had a new idea on terminating/securing the bowden tube inside the extruder head so as to use its sliperyness to ease the filament through the PEEK. Don’t know if this is of any use to you ?? You’re right that the PTFE (in PEEK) is very helpful there. I’ve got PTFE running down each of my extruders, but not the whole Bowden cable. This would make it way harder to do maintenance. It’s easy enough to glue in a slightly longer piece and use a cable to cable coupling, though. Yeah I was trying to get away from glueing. I got the idea for flaring the end of the tube and clamping it between the Nozzle and Peek insulator, from fixing brake pipes on my landrover. I use a flaring tool to flare the copper pipe and it clamps up in a way thai is both fluid tight and mechanicaly robust. The other thing I have been considering is using a break cable outer over the bowden tube to limit the stretch and reduce ooze. Don;t know if this would work or not. It’s just an idea at the moment. You can limit stretch but you’d stilll have compression of the filament itself. Pressure management, open or closed loop seems better. 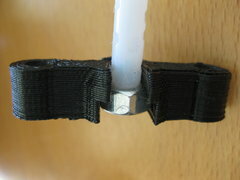 Or use a brake cable for force transduction to close to the printhead. This may have to be non-continous.